This is one of a handful of ‘mushroom’ lichens which grow in Ireland. 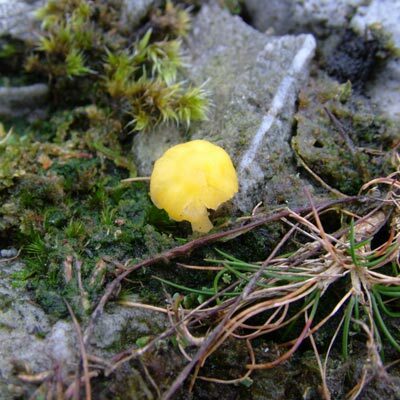 The thallus is granular of the ‘Botrydina’ type (beads or clusters of algae), but the main feature of this species is the lemon-yellow to orange colour of the ‘mushroom’ fruiting body. It grows on wet peaty soils. The similar L. umbellifera is white to straw-coloured by comparison; on wet peaty ground. Simms, M. J., (2016). Lichenomphalia alpina (Britzelm. )Redhead, Lutzoni, Moncalvo & Vilgalys (2002). [In] LichenIreland.